At Garden City Furniture, we know that no project is too big or too small. Whether you need helping designing a single room or an entire home, our talented designers are here to help. You’ll get a team of experienced home designers who know how to balance beauty with comfort and functionality so you’ll get magazine-worthy looks in a room that is livable. And because our designers will visit your home, you can rest easy knowing that every piece of furniture and every accessory will fit exactly like it should. You won’t have to return the sectional because it’s too big or live with an area rug that doesn’t look right because the proportions are off. That’s why we offer in-home design services for free, because we know it’s the best way to ensure that you are completely satisfied with your purchase. And at the end of the day, your satisfaction is our number one priority. First, they’ll get to know you and create a style that fits your personality, your needs, and your budget. Our designers are great listeners and can help you define your style even if you’re not sure what it is! Then they’ll visit your home to take measurements and make a layout of the room. They’ll design a floor plan that efficiently uses the space and ensure that all the pieces will fit exactly as they should. Finally, our designers will work with you to select colors, furniture, accessories, area rugs and window treatments. You’ll get an entire plan to transform your space and make your dreams a reality! 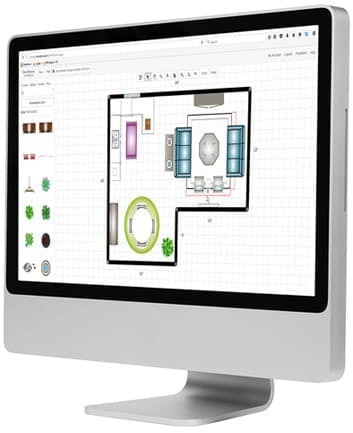 Rather than pushing furniture all over the room, you can use the same tools as professional interior designers to easily visualize new arrangements with the touch of a button! Test out a new furniture placement, map conversational areas, arrange rugs, and determine focal points with our design software, then visit the store for assistance from our talented staff to finalize your dream home!